Poland took on the Super Eagles of Nigeria in an international friendly match on Friday night. 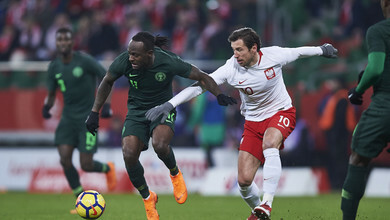 A Victor Moses’s penalty was good enough for Nigeria to earn a 1-0 victory over Poland at the Municipal Stadium, Wroclaw. The Chelsea man won and then coolly converted a 61st-minute spot kick to extend the Super Eagles’ impressive form under coach Gernot Rohr, a run which has seen the West African giants lose just once during the German’s managerial reign. The Eagles lined-up without their influential Captain John Obi Mikel, who missed the friendly due to work permit issues in China. Gernot Rohr provided some insight about the identity of his first-choice goalkeeper by handing teenager Francis Uzoho his first international start. The Nigerian Super Eagles started the first half the brighter of the two sides in a physical contest, but the best chance of the half fell to Poland, with Willian Troost-Ekong clearing what seemed like a certain goal off the line before the break. The Poles responded by upping the ante, and almost equalised when Artur Jedrzejczyk’s goal-bound header appeared to take a slight touch off Uzoho. The onslaught on the Eagles’ goal continued, with Grzegorz Krychowiak looking the biggest threat to pull a leveller for the hosts. In the end, the Super Eagles held on for a win, and will be confident of building on that impressive result when they face Serbia at the Hive Stadium in London on Tuesday.